Our customer in Rouse Hill came to us looking for a full overhaul of their 2nd storey entertaining area. They were after a low maintenance decking solution that could be used all year round. Straight away, an Aluminium Deck and Alfresco Insulated Pergola came to mind. Because this young family is always busy, we designed a new outdoor entertaining area to compliment their home’s facade and maximise functionality. This transformation included aluminium decking built on a powder coated steel frame. This created a separate covered outdoor living space on the bottom level of the home. 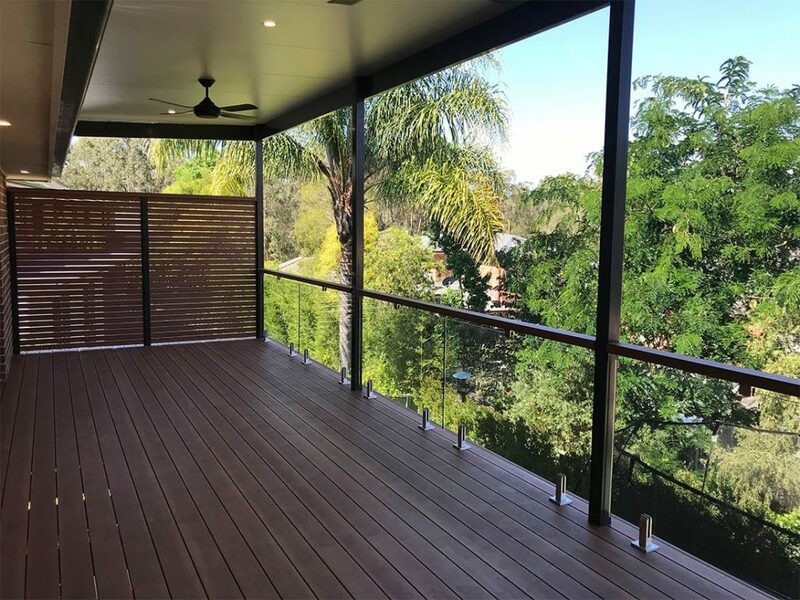 To ensure the safety of our client, without losing their view of the tree tops, we enclosed the deck with glass panels and aluminium top rail to tie in with the decking boards. Our custom designed pergola was constructed using aluminium beams and insulated roofing panels. The pergola was built on roof brackets, to allow maximum airflow and height. Additional access to the deck was expanded from the home’s family room via a new custom made bi-fold door, installed by our team. To complete the new entertaining area, privacy screening to block out the neighbouring homes was installed, finished in the same aluminium style slats. Our client selected matt black fans and LED down lights to complete the functionality of the area.